3.2 What are data centers? 3.4 Optical interconnect: a solution to energy and bandwidth requirements? Current data centre networks, based on electronic packet switches, are experiencing an exponential increase in network traffic due to developments such as cloud computing. Optical interconnects have emerged as a promising alternative offering high throughput and reduced power consumption. Optical Interconnects for Data Centers reviews key developments in the use of optical interconnects in data centres and the current state of the art in transforming this technology into a reality. The book discusses developments in optical materials and components (such as single and multi-mode waveguides), circuit boards and ways the technology can be deployed in data centres. 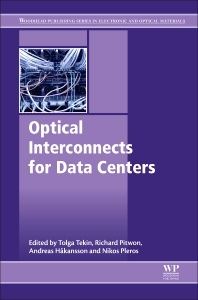 Optical Interconnects for Data Centers is a key reference text for electronics designers, optical engineers, communications engineers and R&D managers working in the communications and electronics industries as well as postgraduate researchers. Tolga Tekin received the Ph.D. degree in electrical engineering and computer science from the Technical University of Berlin, Berlin, Germany, in 2004. He was a Research Scientist with the Optical Signal Processing Department, Fraunhofer HHI, where he was engaged in advanced research on optical signal processing, 3R-regeneration, all-optical switching, clock recovery, and integrated optics. He was a Postdoctoral Researcher on components for O-CDMA and terabit routers with the University of California. He worked at Teles AG on phased-array antennas and their components for skyDSL. At the Fraunhofer Institute for Reliability and Microintegration (IZM) and at Technical University of Berlin, he then led projects on microsystems, 3-D heterogeneous integration, optical interconnects and silicon photonics packaging. He is engaged in photonic integrated system-in-package, millimeter-wave photonics, photonic interconnects and 5G research activities. He is group manager of Photonics and Plasmonics Systems in the System Integration and Interconnection Technologies Department at Fraunhofer IZM. He is coordinator of European flagship project 'PhoxTroT' on optical interconnects for data centers. He is Senior Member of IEEE and co-chair of 'Photonics - Communication, Sensing, Lighting' Technical Committee in the IEEE Components, Packaging and Manufacturing Technology Society. Nikos Pleros is a Lecturer at the Department of Informatics (CSD), Aristotle University of Thessaloniki (AUTH), Greece, since September 2007 and a collaborative faculty member at the Information Technologies Institute, Center for Research and Technology Hellas (CERTH). Richard Pitwon is Leader of Photonics Research and Development group at Seagate Systems responsible for design and development of advanced embedded photonic interconnect solutions for future Cloud and Exascale data centre architectures.